Set Trap Anywhere Where You've Spotted Snakes! The snake trap sold on this site does not harm or kill snakes. It can be used both for snake removal purposes and snake collection purposes. If you have a snake in your house and set this trap, it should catch the snake fairly quickly (that is, if the snake hasn't found some way out). If you are working on snake collecting, then perhaps more patience is needed, especially if you don't have a known snake in the area. Any time you are actively trapping for any animal, snakes or otherwise, PLEASE monitor and check the trap every day. It is very cruel and inhumane to leave any animal stuck in a trap for a long time. Snakes can survive for a while without food, so don't leave a trapped snake stuck for too long. You can easily release a snake from the trap by spraying PAM cooking oil on it. Click the home page for more info on professional snake traps for purchase, or click the below button to buy. We accept all major credit cards and also PayPal. Sorry, no phone or check orders..
Click the above "Buy Now" button, and you will be routed to PayPal, where you can pay by credit card or PayPal account. Sorry, we do not accept personal checks or orders by telephone. $4.95 flat-rate USPS Priority Mail shipping fee is added during the checkout process. Each additional trap ships free. PayPal payments allows you to use your regular credit card or a PayPal account. Traps usually ship same day (Mon - Fri), and arrive in 2-3 business days US priority mail from Seattle, WA. How to trap a water snake - In many cases, you really should leave snakes alone. They are not harmful, and are actually beneficial to more ecosystems. A snake around your home will be a good method of policing insects and rodents. The same goes for water snakes. If you have a pond, you will have far less amphibians and turtles if you have a water snake. Believe it or not, the best method for trapping a water snake is to use a trap that is placed on dry ground. The same trap you use for a snake in your yard can be used for a snake in the pond. Most snakes that swim frequently need to sun themselves as often as possible to keep their body temperatures up. This means they have to get out of the water eventually. Purchase a good glue trap, one of the yellow box traps will be effective. Place this in an area where you have seen the snake basking. The lures on the inside of the box will draw the snake inside and the glue will hold the animal fast. Any trapped snakes should be relocated as soon as possible. Do not leave the snake in the trap for days. To remove the animals without risk to your own body, spray cooking oil inside on the glue pad and the snake will eventually work itself free. 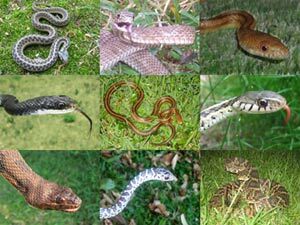 For information about How to Get Rid of Snakes, click this link.